Ronnie Moore, Return HOME. to Personalities. Click here to read about Moore Park Speedway Solo Bike Riding School. Our thanks to Robert Andrews for permission to use the following career story about Ronnie. Ronnie Moore was born in Hobart, Tasmania (Australia) in 1933. The Moore family moved to New Zealand and settled when Ronnie was still in his early teens. Ronnie was born into a motorcycling family. Les Moore, Ronnie’s father ran a ‘wall of death’ traveling motorcycle show which was mastered by Ronnie at the age of 14. He then tried his dad’s speedway bike and took to it straight away. Although he was a bit wild in those early days, the natural raw talent was there for all to see. At the age of 16 Ronnie won the New Zealand South Island championship. He was spotted by Norman Parker the experienced captain of the London Wimbledon team who recommended the management sign up the young Moore, who was obviously a champion in the making, before any other team got their hands on this new and exciting talent. The following year, 1950, as a 17 year old rookie, he was drafted into the Wimbledon team, and so began his international Speedway career. Ronnie qualified for his first individual world final championship at Wembley Stadium in 1952. The following two years he finished fourth, followed by a sixth place in 1953. In 1954, Moore was carrying an injury of a broken leg going into the final. He had built a contraption around his leg for support and to protect his broken limb. Though the odds were against him, and he was in considerable pain, that night he ran a faultless 15 point maximum to be crowned Champion of the World for the first time, at the age of 21. The next couple of years Ronnie finished second and then a non qualifying year, and the following year a lowly 7th place but Ronnie bounced back in 1959. Without dropping a single point Ronnie went through the card that night which resulted in a 15 point maximum, to be crowned Individual Champion of the world for the second time. In his next race, Peter Craven was beaten by Sweden's Ove Fundin. 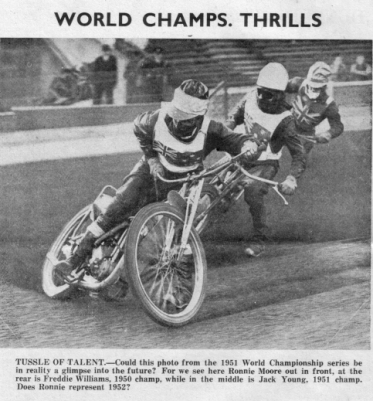 Ronnie Moore went into heat 19 knowing he had to win the heat, to finish the night on 14 points, equal with Ove Fundin and Peter Craven and force a ‘sudden death’ triple run off to decide the 1960 Individual Speedway World Champion. When one of his competitors falls during the race, Ronnie goes on to take the win and his place is assured in the run off to decide the title. Though on the favored inside position, Craven fails to make the start and Moore and Fundin dive into the first turn with everything to play for. Ronnie was all over the rear wheel of Fundin’s machine but after a lap or so Fundin began to pull away. Craven had made up for his poor start but Moore was not to be denied his second position and with it the position of second in the world. The result was first Fundin, second Moore and third for Craven. Ronnie was denied becoming the first triple champion by a whisker and after the most exciting world individual final witnessed at Wembley. The next year the final was held for the first time in the sport’s history outside Wembley at Malmo in Sweden, where Ronnie disappointingly could only finish fifth. The event was not surprisingly dominated by the Swedish trio of Fundin, Born Knutsson and Gote Nordin. This win elevated Fundin into the ranks of the great’s, as a the first triple World Speedway Champion. A feat being denied to Moore the previous year; by Fundin himself. In 1962, for British League racing, Ronnie along with Ove Fundin, Peter Craven, Barry Briggs and Bjorn Knutsson were 'handicapped' by starting 20 yards behind all other riders as the 'big five' were so much better than any other rider and the handicap was introduced to give the others a chance. During all these years, Ronnie Moore was racking up maximums for his league team Wimbledon and countless individual and Golden Helmet match race events, all over the world. He married Jill, an ex Windmill girl and they had two daughters. He also tried his hand racing cars and from time to time returning to his roots and giving demonstrations of his ‘ Wall of Death’ abilities. In 1963, after another badly broken leg Ronnie retired from Speedway racing and returned to New Zealand with his family. 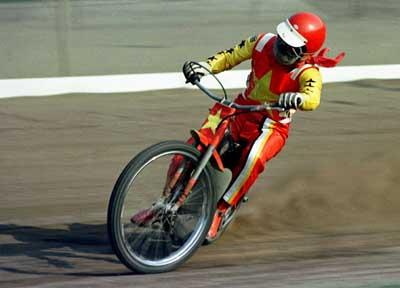 We acknowledge the Wimbledon Speedway site and photographer Mike Patrick for this great shot of Ronnie. Ronnie Moore had been competing in the world individual championship final at the highest level of the sport since 1950 and competed in a total of 14 World finals. He then retired from racing once again and returned to New Zealand and started a motorcycle business. He did race from time to time and competed in a series of ‘world champions troupe’ organised by ex champions Barry Briggs and Ivan Mauger at events in Australia but was seriously injured in a another big track crash after colliding with Englishman John Louis and was very lucky to survive with his life. 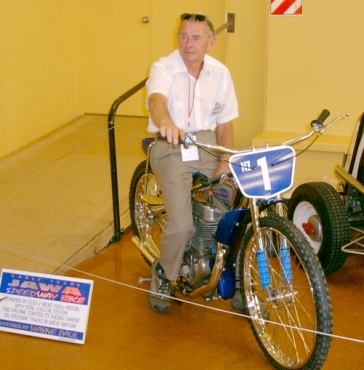 Ronnie's last speedway ride took place at Jerilderie Park, Australia on the 20th January 1975. His competitive speedway racing days were now over. Ronnie has been involved in a local training track at Christchurch, New Zealand giving advice to youngsters and beginners at all levels, passing on all the years of his invaluable experience. He also spends time fishing or helping out at the training track. Her Majesty the Queen presented Ronnie Moore with the M.B.E for his services to the sport. Photo at right was taken in Jan.2006 at the Palmerston North 75th Jubilee.